Christopher Osman, an ex-Navy SEAL accused of being a mercenary, arrested in Haiti along with four other Americans, two Serbians and their Haitian driver revealed the identity of the big businessman they came to Haiti to protect. "We're not mercenaries. We're not murderers. We're just doing security work," Osman, 44, told the Miami Herald. Osman to the newspaper he was told after landing in Haiti that they would be escorting a Haitian businessman, Josue "Josh" Leconte, to the bank that Monday to sign a multimillion-dollar deal. Josue Leconte owns the civil engineering firm, Preble-Rish], has done millions of dollars of business with the Haitian government over the years, according to Jake Johnston, a research associate at the Washington-based Center for Economic and Policy Research who recently published a three-week investigation into the contractors' case, The Associated Press reported. Leconte's partner is related by marriage to former president Michel Martelly. If Christopher Osman is telling the truth, where did all this allegations come from that they were in Haiti on a mission to burder the ex prime minister of Haiti, others claim they were there to rob Haiti's central bank for the president. 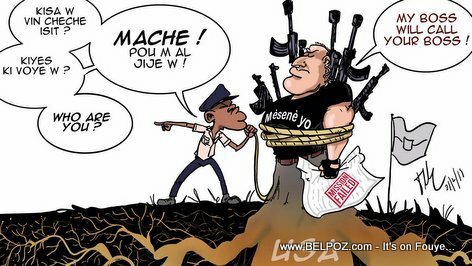 People say whatever they want in this little country called Haiti!